Money at home, talent abroad? No! Amidst the whirlwind involving sovereign debt, risk premiums and the conditions for obtaining the famous “line of credit”, Standard & Poor’s –well-known for its impartiality!- announced on August 22 that if Spain requests a rescue, in which speculators will earn millions, it will not lower our country’s rating as it had intended to do. When will institutions, both public and private, stop playing these shameful games, which have devastating effects on economies that suffer from continuous budget cuts (including cuts in education, healthcare and science), as if they were inevitable, instead of being offered incentives for economic development and the creation of jobs? When will there be a popular outcry against EU leadership in which 26 of the 27 Member States merely obey “reference guidelines” affected negatively by the rating agencies announcements? Laws must be fair. Otherwise there is no "rule of law", because they could promote ethically reprehensible judgments. If sexual offenses were committed that contravene the laws of Sweden, nothing should prevent justice from being done as warranted. But without enabling any other country, and especially the US, to take advantage of his extradition to try this well-known “digital anarchist” for divulging “state secrets”. State secrets… aren’t they precisely what the incredibly expensive intelligence services are supposed to uncover? The Australian hacker demonstrated that states must now be much more careful when safeguarding their true secrets and must also prevent actual and sometimes quite hilarious gossips from being classified as “confidential”, while likewise casting a totally “flunking” grade on a large number of their diplomatic delegations. Wikileaks founder Julian Assange supposes, suspects, assumes…. that the United States will take action as soon as he leaves the Embassy of Ecuador in London. It would suffice for the United States to officially announce that it will not request his extradition or put him on trial. In fact, the spokesperson for US diplomacy indicated on August 16 that “The United States has no intention of intervening”. But the staunch Republican Chairman of the House of Representatives’ Homeland Security Committee has asked to White House to seek extradition. It would thus appear prudent to await the outcome of PFC Bradley Manning’s forthcoming court martial. In view of the above, I deem unwarranted the suggestion in the August 21 edition of an important daily such as The Washington Post that the United States might adopt economic sanctions against Ecuador (the world’s largest producer of bananas and shrimp in which a large number of its major companies are US owned). Commenting on the “Fraud against the Rule of Law” in the August 22 “El País”, Ana Palacio asks why the European Union has remained silent during this matter. Given that they remained silent after the “Azores Three” decided to invade Iraq, resulting in thousands of deaths, injuries and over five million displaced persons… and given that they failed to react when Libyan leader Gadaffi was done away with in a manner that was certainly unacceptable from any perspective… it wouldn’t seem appropriate to make a big fuss over a comparatively minor matter. But the fact is that the time has passed in which the most powerful countries can decide who is guilty and who isn’t, replacing democratic governments with military juntas with impunity. Now all states will achieve the same “right to rights”!... and will refuse to be dominated by a few multinational consortia. I never cease to repeat that what is urgently required is a fully authoritative United Nations, endowed with the necessary personal, financial and technical resources. It is a serious error, based on anachronistic forms of analysis, to judge by their GDP nations that have been impoverished by the greed of more wealthy countries which, moreover, have sought to govern “globally” (G-7, G-8, G-20). Baltasar Garzón has the prestige required to appropriately handle this matter. Given well-known precedents from times past (Cardenal Mindszety, for example), it would be best to address this matter as I’m sure President Obama would… if he weren’t subject to the implausible harassment of Republicans who are so full of themselves that they are incapable of accepting any solution originating from multilateralism or from the simple principle of equality before the law. “The exodus of doctors and nurses has doubled due to budget cuts in healthcare”... “The emigration of professionals mirrors the increase in unemployment”…, according to articles in the press published on August 7th. So much personal effort gone to waste! So much talent thrown overboard!... for having to inevitably comply with the conditions imposed by the “markets”. Europe and the United Kingdom are the only ones left that are still subjected to the dictates of the “rescued globalizers”, who now impose their conditions with no recollection of the past, to the extent that they appoint governments and create unsustainable social hardships in countries such as ours. The fluctuation of stock market prices, the urgent austerity measures that prompt generalized depression, recession and a radical drop in non-essential consumption… and what is really serious, a bleak future for us all. The funds (or rather, “lines of credit!”) granted us with so many obligations attached, are used for the banking institutions whose conduct has been less than exemplary…. while the pressure to pay off debts and lower the deficit still remains. The excesses committed by some Spaniards must undoubtedly be moderated and avoided in the future. But without affecting the fundamental pillars of the Nation: education, healthcare, knowledge. The one thing that must always be safeguarded is talent: doctors and healthcare personnel who have completed their training; scientists and professors; well-trained professionals… This and none other is the basis of our prosperity and, in consequence, what has cost us so dearly (in economic terms, too) must not be subject to budget cuts. Offering this talent, this ripened fruit, to other, more experienced countries (that also often promote this immigration) is the worst operation in which a sovereign state can engage. Don’t allow this. Correct this error. The European Union needs for two or three of its leaders to make an about face and to put their houses in order. Observe the deceleration in Germany. And the urgent and humiliating regulation of the speculation tormenting BANKIA… And the debacle of work and employment, with no incentives or subsidies… and instead of lending a hand, the European Central Bank has joined the rating agencies and experts who are fanning the fires. José María Ridao had no qualms about underscoring this in his August 8 article in “El País”: “Those economists who fanatically support austerity policies to combat the euro crisis while ignoring its devastating effects on unemployment and poverty betray their fellow men”. Correct this error. Present a Plan that has been well prepared and agreed by consensus, which clearly sets forth how, how much and when the financial demands will be met, rejecting inadmissible deadlines or terms that are incompatible with growth. A Plan that also clearly indicates how and when those responsible for corruption and/or illicit practices will be severely judged… and what intangible aspects will be safeguarded to ensure social welfare and sustainable development. Discuss. Consult. Rethink this. Implement measures democratically. You’ve already seen that the “legal arbitrariness” of an absolute majority in Parliament breeds more problems than it solves. Think of the future. You are forcing many people to leave Spain, some of whom still believed in your promises to create jobs. Money, yes; talent no? Correct this. Otherwise, protests may reach alarming limits than no one desires. 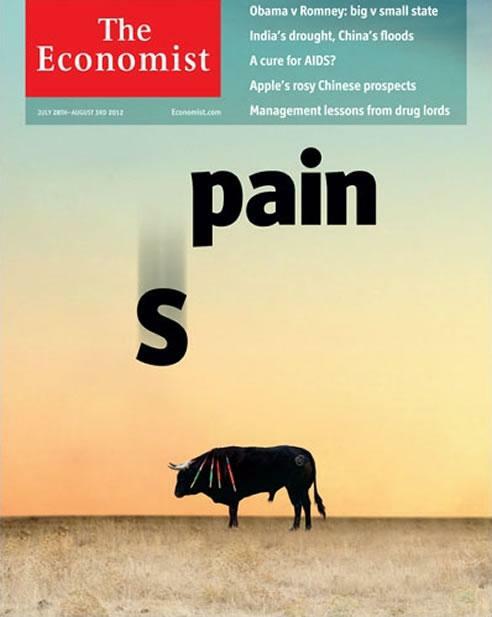 The July 28th cover of “The Economist” on which the “S” has fallen from “Spain”, leaving “pain” warrants careful consideration. The inside article observes that “The prognosis for Spain is bleak. The economy is in recession, the public sector is cutting spending and the private sector is reluctant to invest… To escape this situation Spain requires outside aid… that might come from the ECB, together with other rescue sources… The Euro zone must unite around a plan that is economically sufficient and politically feasible… It is necessary and urgent to implement federalism and pro-growth policies… The important lesson to be learned from Spain is that delay is worsening the odds of the euro surviving…”. And it concludes, “Europe must understand –and hopefully it’s not too late- the necessity of obtaining loans directly from the ECB”. · There are still no fees charged on financial transactions. · “Capital flight increased in May due to Bankia’s situation, reaching historical levels”, according to an article published in “Ideal” in Granada on 01 Aug 12. In the first five months of the year over 163,000 million euros were withdrawn from Spain… to be invested in third countries… or stashed in tax havens. · So that the present won’t lead to an uncertain future, the budget cuts made in healthcare and education, which according to information provided in the media will represent “9,627 euros in 2014”, are particularly unfortunate. They are making a mistake. All other capital, all of our “financial and labor health” ultimately depends on health, education and science. Make closely calculated budget cuts… but don’t include the fundamental pillars of social welfare, and emulate the United States by issuing euros or “Eurobonds” or “hispanobonds” for growth. With budget cuts alone, we will sink deeper and deeper. “Job creation in the United States stimulates Wall Street”, underscored the US press on August 4. This is a good symptom and is the result of issuing over 300,000 million dollars in incentives a few months ago. · And what has happened in TVE? Where are the news broadcasts that formerly provided a substantially unbiased view of events? I would like to render homage to some excellent journalists (Pepa Bueno, Ana Pastor, Xabier Fortes…) and deplore the fact that the Government is returning to its old ways from the beginning of the century. We’ll have to watch other channels. What a shame! · In 1967 I went to the Director General of Health (at that time there was not Ministry of Health) to implement the National Plan for the Prevention of Disabled Children… I had specialized in perinatal biochemistry and neonatal molecular pathology. I subsequently participated in the transition and contributed to reach appropriate approaches to very sensitive and delicate issues. The book “Gen-Ética” (2003), coordinated with Carlos Alonso Bedate, reflects very interesting and applicable criteria and experiences. Why were we not consulted before proposing changes in the grounds for interrupting pregnancy that are absolutely inadmissible from a scientific perspective? S the economy, we also have to “Do God’s Bidding” in education and especially in secondary schools. That was the hair-raising title of an article by President Esperanza Aguirre on the editorial page of the July 7 “ABC”. Reading her reflections in this article about Bismarck’s Germany and a European culture based “on the thought of Greece and Rome, and the morals and values of Judeo-Christian religious tradition” caused me much perplexity. And, alas, after rendering tribute and expressing her admiration for German education, she concluded by manifesting that “as is often the case, the solution is freedom”. With that I’m in almost complete agreement: the solution is always freedom. · “The freeze on public employment has been extended”. Indiscriminately. This is a mistake. One thing is to recommend and monitor austerity measures… and another is for those who pledged to reduce unemployment to limit the efficiency of services and raise unemployment figures. · They who are cutting subsidies for dependent persons are also making a huge mistake. In contrast to the colossal amounts being spent to stabilize the financial situation, to save a mere pittance many of the most vulnerable citizens will now be neglected and many “basic jobs” will be lost. · And amidst this economic turmoil, last Friday on the sly, the Government approved a change in the content of the Education for Citizenship curricula for primary and secondary schools, renaming it “Civic and Constitutional Education”. This is another error that separates us conceptually from Europe, where it’s so hard for us to fit in. As I have written repeatedly, in 1993 in Montreal a Conference of professors and educators from all over the world approved a “World Plan of Action for Education in Human Rights and Democracy”… Almost twenty years later Spanish government leaders now prefer to follow anachronistic and discarded guidelines. This is a mistake. And this time there may also be numerous “conscientious objectors”, which they (along with the ecclesiastical authorities) so enthusiastically applauded when “Education for Citizenship” was first approved. · The Government doesn’t miss an opportunity to allude to the “legacy” it received… although most of its problems have originated in the Autonomous Communities and related institutions in which it holds a majority, such as Valencia, Murcia… CajaMadrid, Caixanova… and in the awful throes of the “real estate bubble” at the end of the past century, which the socialist government was unable to contain and redirect. • And in the European Union? · When proposing a “pact for growth”, Hollande initially considered issuing 120,000 million euros in incentives for businesses and to promote employment, as Obama did in the US. That’s the right way. Budget cuts and increased unemployment may lead to social rebellion, even revolution. No, that’s not what should be done. That’s not “doing God’s bidding”. That’s doing the bidding of the great (military, energy, financial and media) domain. · “Germany Pressures the ECB against the Rescue Plan for Spain and Italy” read the front-page headlines of the August 2 “El País”. And inside: “The debt ceiling imposed by Rajoy forces Andalusia to make additional budget cuts… The Andalusian government says that Rajoy intends to “privatize, dismiss and close down…” And, very important, “the Federal Reserve is monitoring the decisions taken in Europe”. On August 3: “The ECB forces Spain to make an additional cut”… “Public (but not private) schools are losing teachers for the first time in 23 years”… And the risk premium is rising, while the IBEX drops… and the “markets” buy today to sell tomorrow… ! · Faced with this complex scenario, it is essential to adopt an interdisciplinary approach and to give philosophy and ethics prominent roles in order to make accurate diagnoses for timely treatment and for foresight, since prevention is the supreme aptitude of human beings. Fernando Vallespín recently quoted Borges when he wrote “We are not united in love, we are united in horror”. Human Rights were proclaimed precisely “to free mankind from fear”. It is time to take action, bold and peaceful action, with innovation and creativity. · With the delocalization of production on the one hand and robotization on the other, we will have to start imagining “Another Economy and Another Way of Life”, the title of a recent book on the crisis by Juan Torres López. He asks, “Is the dictatorship of the markets inevitable?” and he concludes that another economy is possible. Yes, another way of life from now on. Another way that is fully democratic, forever eliminating the scandalous inequalities that fomented the absolute power of men and the temptation to replace at the local, regional and global levels a genuinely democratic system with groups of incompetent and greedy plutocrats. · Now is the time of “The Peoples,” the people. For the first time in history all human beings can progressively express themselves and have access to a global vision of the world. · Now is the time for federalism at the national and European levels, to prevent conflicts and disputes that should never arise and are unacceptable. Backing the autonomous communities into a corner is also a huge mistake. Political, economic and ethical coordination is essential to conquer the immense inertia of a European Community that will never become a Union if it doesn’t emancipate itself in areas such as security and economy. The euro zone can’t continue on bended knee, at the mercy of the large multinationals. Some time ago I wrote that knees are for lifting us up, not for kneeling or tip-toeing around to follow the orders of colossal consortia or multimillionaires who, with a complete lack of solidarity, evade thousands of millions of euros to deposit them in that tax the havens that unfortunately border Europe. · Let’s send our best professionals abroad (we’ve paid for their education, university studies, doctorates), as well as our capital… Obsessed with stock market fluctuations, it seems our government leaders only have eyes for the IBEX. · It’s essential to mobilize the middle classes who aren’t conditioned by factors affecting the less fortunate. · Globalized neoliberalism, in addition to replacing the democratic principles of social justice and liberty so aptly set forth in the UNESCO Constitution with the laws of the marketplace and the United Nations with groups of oligarchs (G-7, G-8, G-20), also delocalized production and weakened Nation-States by transferring the majority of power, including political power, to the large multinationals… and to the markets! · The introduction to an excellent book “Economic and Social Alternatives to the Crisis”, edited by Alfonso Guerra y José Félix Tezanos, states that “crisis contexts such as the one we are experiencing render past success strategies void… and require us to reconsider our modus operandi by applying significant amounts of innovation and creativity…”. I like to repeat that the future has yet to be written and that there are critical moments in which we must invent the future. Crisis and opportunity: we are now at a historical turning point. We have the “human tension” and the knowledge to do it. There are only two conditions: to promote democratic conduct at all levels (personal, local, national, regional and global) and to dare to do it. Genuine leaders are those who, when the occasion arises, dare to use their powers. Dare to know and know how to dare. If we don’t, we will deserve Albert Camus’ terrible disdain: “I despise them, because they could have done so much, but dared to do so little”. · Reality, so adverse, will finally overcome the inertia of the majority of citizens, many of whom are outraged but still remain passive? Plagued by circumstances so different from those that brought them to power, I sincerely hope they will seek consensus with the same attitude and intelligence with which the Moncloa Pacts were sought and achieved. If so, the “S” may perhaps be returned to its proper place. Otherwise, the prognosis that I make from my “tired old eyes” will be quite negative. That’s fair warning!